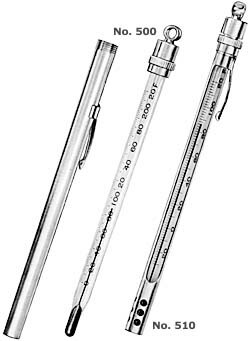 Pocket Case Thermometers - Philadelphia Instruments and Controls, Inc. - Specializes in the production of temperature related products. These instruments are supplied complete with a 6" hard aluminum case, pocket clip, and easy refill top. General Testing. 0° F to 220° F with 2° Divisions, red liquid or mercury filled. 6" Armored case, perforated end. Ranges -20° F to 120° F with 2° Divisions, 0° F to 220° F with 2° Divisions, red liquid or mercury filled. Daniel Gabriel Fahrenheit was born in GdaNsk, Poland, on May 24, 1686. After studying and traveling he eventually settled in Amsterdam, the Netherlands, where he became a maker of scientific instruments. He discovered a method for cleaning mercury so that it would not stick to a glass tube. This was essential to devising his mercury thermometer.